As pointed out by The Next Web Apple has begun to role out a new redesign for category home pages in the App Store. The redesign follows suit with the home page of the App Store, displaying a large horizontal banner which runs through the category’s featured apps. As of now, the redesign is only appearing in the Education and Games sections. Besides the banner, Apple has removed the section that displayed all of the category’s apps, and has replaced it with the “Staff Favorites” section. Now, the three sections for each category are: ”What’s Hot”, “New and Noteworthy”, and “Staff Favorites”. The iPad is also seeing these updates — again for only the Education and Games section. 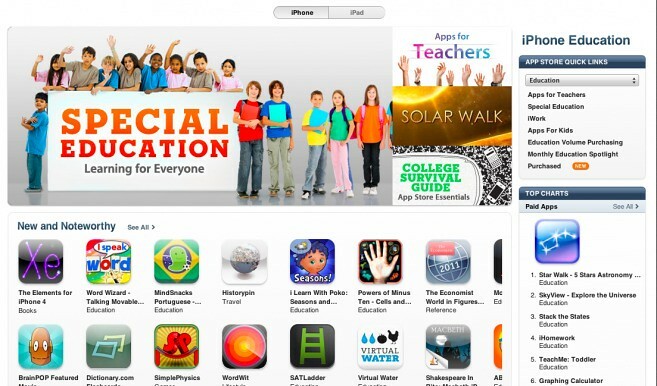 The iPad’s “What’s Hot” section is now replaced by “Staff Favorites,” and the banner is displayed. This is most likely on its way to rolling out through the whole App Store.